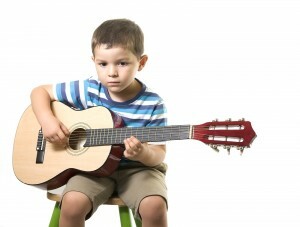 When Should My Child Start Learning Guitar? Many parents have asked, “What is the best age for my child to start playing the guitar?” As you can probably figure out, each child is different, so there is no hard, fast number. Many factors need to be considered for the individual. This overview will help you make the right decision. Playing guitar well (or at all) requires a great amount of physical dexterity. Most very young children do not have the hand strength, nimble fingers, or fine motor skills necessary to do this and are not likely to until they are at least 5 or 6, and usually not until 8 or 9. As you can imagine, exceptions do exist. If your child is dexterous, then by all means, allow that child to get started as early as possible. When you are learning music, as when you learn other subjects, you are given lessons and homework. Daily regular practice is the key to success in music, no matter what your age. Also, as with any other learning, it requires a lot of patience. Your child must be able to concentrate for at least 15 minutes at a time. Can he or she do that? If not, hold off on lessons. Do an honest analysis. Is your boy or girl ready for the patience, concentration, and practice necessary to continue enjoying it, practice daily, and improve? If yes, great! Enroll them with a qualified instructor right away. If not, that’s all right, too. “No” today does not mean “no” forever. If they want to learn, their time will come. Has your child taken an active interest in guitar? Has he or she heard you play and decided they wanted to play as well? Or maybe they saw someone play on TV or YouTube and it piqued their interest. If so, that’s wonderful! They will be receptive to learning. Unfortunately, far too many parents force their child into learning a musical instrument. For example, a young couple buys their 10-year-old son a guitar. After banging on it for a few days, he decides he doesn’t want to play it after all. But since his parents had already invested more than $100 for the guitar (sometimes a lot more), they want the boy to take lessons anyway. Another example is of a couple that decides guitar lessons would make their 9-year-old daughter more cultured, yet the daughter sees her parents coaxing as pressure. Even if she had been interested in learning a new instrument, she may rebel simply because it’s something her parents are nagging her to do. Some simple (and yet often ignored) advice is to put the guitar away if your child is not interested. Even if you do manage to pressure him or her into taking lessons, they will stop at the first moment they can. If this does happen, take heart! They may take it upon themselves to learn guitar or another instrument when they are ready. Perhaps your vision is not the same as theirs. Maybe your daughter wants to be a drummer or your son wants to play the flute. Let them experiment and see what truly interests them. If your child is ready to get started on learning guitar, then by all means start the lessons. If it’s not quite time yet, you can still keep your child interested in guitar. Take your kid to a concert in the park. Listen to one of your child’s favorite songs and point out the guitar parts so he or she can understand its role in the song. Keep the guitar out and play it yourself from time to time. They may pick it up and play it too. Then, they may come to you asking for their own instrument and lessons.